During a witness audit last week, a customer asked what the difference was between a resistance instrument Under Load and Open Circuit. The quickest answer to the question is that Constant Voltage (Under Load) instruments would be a Laboratory type instrument, while the Open Circuit is a general indicating instrument. Constant Voltage units do not vary in test voltage within their designated performance range(s). For example the Prostat PRS-801 Resistance Meter will vary by a few millivolts at 100V from 2.0×105 to 2.0×1014 ohm range. 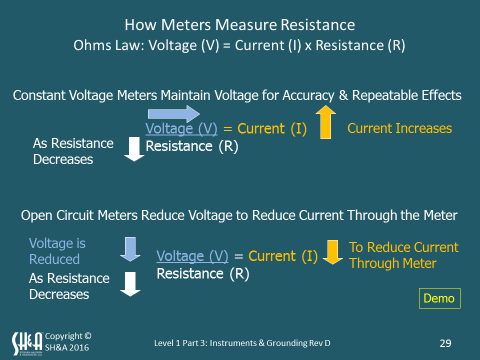 Here is a chart showing an Open Circuit instrument’s test voltage when measuring different resistances. At high resistance, test voltage is high. 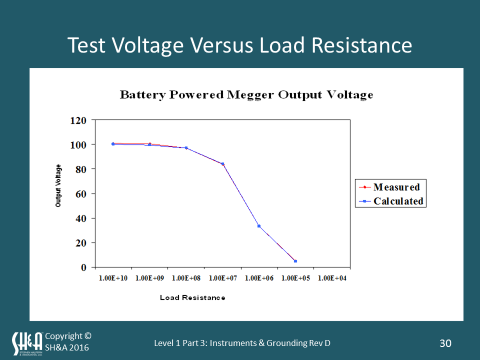 As resistance load is reduced, so is test voltage. The Constant Voltage (Under Load) unit is more accurate and repeatable. It is a closer tolerance instrument often having a measurement variance of less than 2% from E5 to E10 ohms. On the other hand and Open Circuit instrument may have a tolerance of greater than ≥10% and often a much higher error, >50%. Finally, materials react to test voltage and current flow, which generates heat. During a measurement the Constant Volatge unit is going to provide the same controlled voltage and subsequent current flow for a given resistance every time it makes a measurement. This makes the unit’s measurement highly repeatable. The Open Circuit unit will vary and provide different voltages at different resistance ranges, thus materials will respond differently to the instrument’s measurements at different resistance levels. The Constant Voltage instrument is most accurate. That is why the PRS-801 is one of the industry’s most important measurement standards.